A Canadian teenager whose website annoyed Bill Gates' lawyers is giving it up in exchange for Microsoft goodies, including an Xbox console. Mike Rowe, 17, thought it would be fun to add "soft" to the end of his name to set up the site, mikerowesoft.com. The computer giant thought it was too close to its name, and offered him $10 to take it down which Mr Rowe refused. The new deal includes Microsoft paying for a new site, expenses and a subscription to its developer forum. "All along I just wanted to prove a point that the small guy can win against the giant corporations," Mr Rowe said on his website last week. He had originally demanded Microsoft pay him $10,000 to take down the site, which he set up as a forum for designers and programmers. The out-of court settlement was reached amicably on Friday. 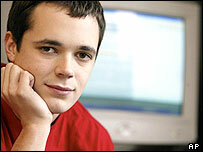 "We believe he's a bright young man with great potential," said Jim Desler, Microsoft spokesman. "Mike will soon decide on his new name and website and we have agreed to help redirect any traffic to his new website to ensure he does not lose any business." As a sign of goodwill, Microsoft said it would also give the teenager training for certification on its products, and he and his parents have been invited to the technology giants' headquarters in Redmond, Washington. Mr Rowe was not able to comment on the settlement. His father said he was too busy with his exams. But on Sunday he wrote on his website, "Sorry there hasn't been a lot of news posted by me lately, I have been very busy with school, exams, the media, new website and settling with Microsoft." Want to be Bill or Gareth Gates?